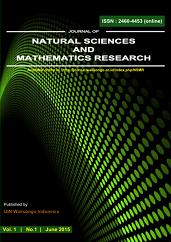 Journal of Natural Sciences and Mathematics Research, an international journal, provides a forum for publishing the original research articles, review articles from contributors, and the novel technology news related to natural sciences and mathematics research. Scientific articles dealing with fundamental sciences, material sciences, mathematics, materials characterization, etc. are particularly welcome. The journal encompasses research articles, original research report, reviews, short communications and scientific commentaries in fundamental sciences and mathematics including: fundamental sciences, fundamental physics, fundamental chemistry, fundamental biology, mathematics, applied sciences, applied physics, applied chemistry,applied biology, applied mathematics and materials characterization. Analysis of Optical Properties TiO2, ZnO, TiO2: ZnO Thin Films Deposited On Glass Substrate Using Sol-Gel Spray Coating Method And Application For Degradation Of Dye Liquids.